THE TEMPLE OF MOOKAMBIKA AT KOLLUR THE TEMPLE OF MOOKAMBIKA AT KOLLUR - Shiva Maha Purana, Vishnu Purana, garuda purana, bhavishya purana, skanda purana. Kolhapura ‘Adi Maha Lakshmi’, popularly known as ‘Kollur Mookambika’, is an ancient sacred Sri Kshetra and a famous Siddhi Kshetra, whose mythological lore runs back to millenniums. It is an enchanting place in the midst of a t hick forest, encircled by mountain ranges all round, with line natural beauty. Here is a self manifested ‘Jyotirmaya I,ingam’ with a ‘Suvarna Rekha’ the dominance of Shakti. 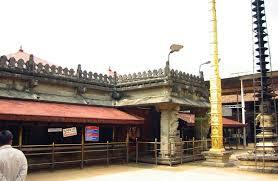 Kollur is a small, but ancient place situated at a distance of about 150 kms. north-east of Mangalore, in Udupi District of Karnataka, and is famous for the temple of Mookambika, who is revered as the goddess of learning. Situated on the great Kodachadri peak on the slopes of Western Ghats, amidst rich scenic beauty and enchanting surroundings, and connected by good metoral roads from all sides, the shrine attracts a large number of pilgrims from all over India, throughout the year. According to ‘puranic’ tradition, it is believed that a sage called Kola Rishi was doing penance here for a number of years, and was obstructed by a demon called Kamhasura, who was also doing penance to please Shiva, with the idea of obtaining the boon of immortality. In order to prevent the demon getting his desire fulfilled, goddess Durga made him dumb (mooka), and when Shiva appeared before him, he could ask for nothing. Soon after, Kamhasura got enraged and began troubling Kola Rishi, who thereafter, prayed to Durga for deliverance. The goddess appeared again and destroyed the demon. At the request of Kola Rishi, Durga stayed here to be worshipped perpetually. Thus, the goddess was given the name as ‘Mookambika’. There is another popular belief that even the dumb (mookas), who worship the Devi here are cured of their dumbness and are transformed into great scholars and poets. Many learned persons and writers of Kerala and Karnataka are great devotees of Mookambika and worship the deity as the goddess of wisdom. It is said that Adi Shankaracharya visited this place during the early part of the ninth century, and consecrated the idol of Mookambika with Sri Chakra. He stayed at the temple for quite some time and prescribed the mode of daily worship and the annual rituals to be performed during ‘Navaratri’. The place where Shankara stayed and the gate by which he left are at the back of the deity and to the north respectively. The principal idol or the ‘Moolastham’ is a ‘Linga’ on which is a golden line, which divides the head into two unequal halves, the greater representing the three goddesses, Uma, Saraswathi and Lakshmi, and the smaller, Brahma, Vishnu and Maheshwara. The idol of Mookambika is in the centre behind the ‘Linga’. On either side are the idols of Durga and Saraswathi. The temple of Mookambika was being patronised by the Hindu kings and was the regional shrine during the reign of Honneya Kambali kings, who had Hosangadi as their capital. There are a number of inscriptions to indicate the various grants made by Honneya Kambali Pandari Deva and Honneya Kambali Buka Vodeya between 1522A.D. and 1560 A.D. Kollur region was captured by Venkatappa Nayak in 1608 A.D., and he renovated the temple. Bhadrappa nayak granted several endowments in 1664 A.D. The goddess Mookambika was the tutelary deity of the Nagara or Bednore Rajahs, and many of the jewels now adorning the idol are said to have been presented by them and their overlords of Vijayanagar. Among them, there is a big emerald of the size of a human palm. In 1775 A.D., the Mahratta Chieftain Angria and Sultan Ali of Cannanore raided the temple and carried away a large quantity of jewels, gold and gems. It is believed that several parts of the shrine contain even now very valuable treasure concealed during the raids. The river Sowparnika emanating from the Kutaja hill in this region, flows near the temple, and is considered not only sacred, but said to have medicinal property capable of curing several ailments. Many patients suffering from skin diseases have confirmed that they have been permanently cured by taking bath in this river for a few days. On the top of the hill, there are two fine places known as Sarvajna Peetha and Chitra Moola where Adi Shankara and many other Yogis practiced penance and attained Yoga Siddhi. There are two small temples on the top, dedicated to Uma Maheshwar and Kalabhairavi. It is said that Raja Ravi Varma, the famous artist and painter of Kerala, stayed at Kollur and dedicated his paintings to the Devi. Many learned scholars and musicians of Tamilnadu and Kerala have been blessed by the Goddess at the Saraswati Mandapam near the temple. Kollur is connected by good roads and a number of State and private buses and vans operate in this route at frequent intervals. The temple has maintained a guest house and a I )harmashala for the convenience of the pilgrims and visitors.